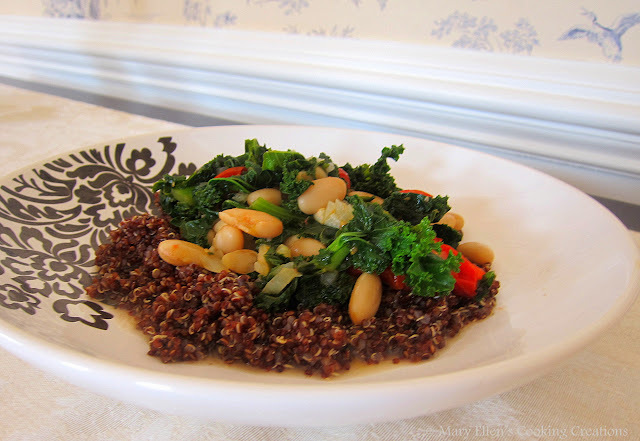 My latest kale recipe was a quinoa lunch bowl with kale, tomatoes, onions, garlic, and white beans - super filling, packed with nutrients, healthy, lots of different textures, and perfectly savory. And what a great choice for lunch since you don't have any guilt when eating it and it actually fills you up for the entire afternoon. You can eat this one cold, room temperature, or warm, depending on your preferences and mood. It was cold in my office last week so I chose to warm it up. I usually cook with regular quinoa, but my store only had red the last time I went shopping. I didn't think it would be any different, but it actually was a touch more bitter, even after thoroughly rinsing it. So if you want something milder, stick with regular quinoa. Put 2.5 cups of liquid and the quinoa in a pot. Bring to a boil, and then cover and lower to a simmer. Let simmer for 15 minutes or until done. Add onions; sauté 2-3 minutes. Add garlic; sauté 30 seconds. Add tomatoes and beans; stir. 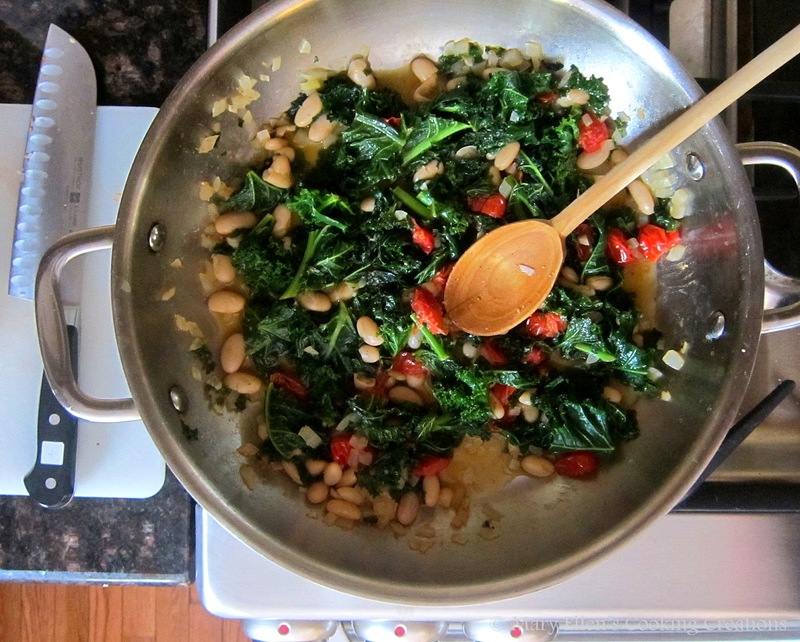 Add the kale, broth, salt, and pepper. Cover and lower heat to medium. Let simmer 5-7 minutes. Remove the lid and let simmer 2-3 more minutes. 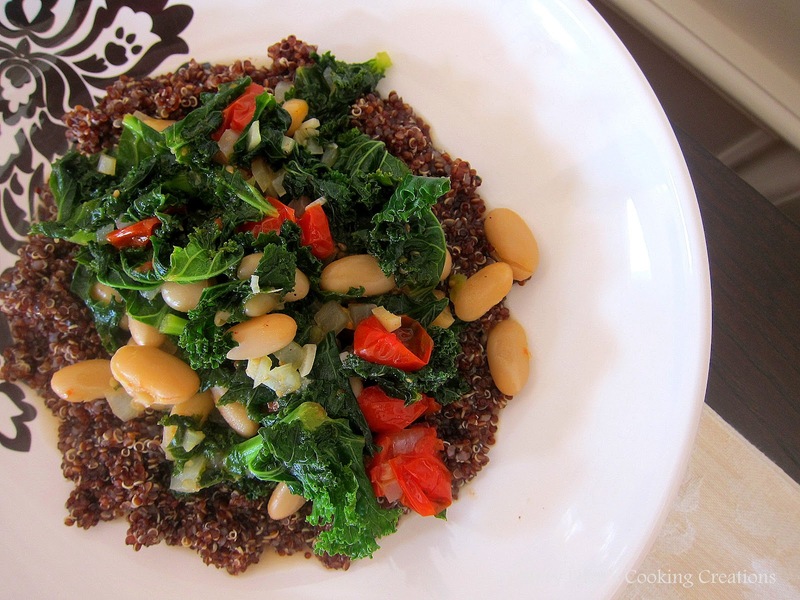 Put half of the quinoa on a plate and top with half of the kale mixture.